This report presents my experiences of participating in the Erasmus+ Structured Adult Education for Staff course, NET 4, Managing our Natural and Cultural Heritage Assets, funded through the –Erasmus programme and hosted by Maarika Naagel from Viitong Heritage Tours. I visited Estonia from 31st July to 7th August 2018 and explored the islands of Saaremaa and Muhu as part of a group of eight. We also spent two days in the Estonian capital city of Tallin. I had no particular preconceptions about Estonia as a place. I knew it was located close to Russia and had been impacted by Soviet occupation. I had also heard that there was a strong tradition of singing in Estonia. The themes of the visit were cultural and environmental interpretation, sharing and evaluating knowledge about traditional skills and crafts, Estonian traditions of dialect, daily lives, costumes, handicrafts, fishing, and Estonian culture history. As the Information Officer for Loch Lomond and the Trossachs National Park Authority in Scotland, I was keen to participate in the project as I believe there are huge benefits in learning about different cultures and finding out how different countries deal with similar issues to those we deal with here in Scotland. I believe that such interactions are mutually beneficial and hoped that the people in Estonia that I would have the opportunity to meet would also benefit from my sharing my personal experience and knowledge with them. The course offered the opportuntity to look at projects in Estonia that are focused on keeping authentic traditions alive and passing them on to the next generation. This is the Year of Young People in Scotland, and the Park Authority is looking at as many opportunities as possible to engage with young people, to encourage them to come to the National Park, to learn about the environment and to enjoy being outdoors. At the National Park Authority we have already various projects that involve engagemnt with local communities and due to the number of local communities that live within our National Park we are constantly looking at ways to both suppport local communities whilst also protecting the environment. some of the decisions we make in an effort to manage the environment as well as managing the expectations of our visitors. The Park Authority has three core activities which are Conservation, the management and protection of our natural heritage, Visitor Experience, the promotion of the Park as a sustainable tourism destination, and Rural Development, to support and enhance local distinctiveness, improving the quality of life for local communities. These activities underpin the development of training plans on everything from tourism to land management and work to engage young people and teach them about conservation and environmental issues. On a personal level, I have a background in the arts, I am a graduate of Glasgow School of Art with a design degree, specialising in embroidered and woven textiles, I therefore had a particular interest in Estonian art and crafts and the preservation of local culture. What does all of this have to do with strong women? In completing this report, I am spoilt for choice in terms of the range of experiences to document. I have chosen a theme of strong women to link these experiences. One of the key impressions that I took away from my visit to Estonia was the resilience and creativity of so many Estonian women, not only those that we met, but historical figures who have coped with turbulent times in the history of their country. Despite the hardship of occupation, Estonian women have retained a strong sense of their own identity and have worked to retain their culture and heritage. I had hoped to learn more about the country from my visit, I had not expected to meet so many inspiring women, and in doing so, I was personally challenged in ways that I had not expected. I have learnt things about my own capabilities, which have led me to ask questions of myself and my aspirations, which was an additional and unexpected consequence of participating in this course. The focus of our visit was to learn more about the natural and cultural heritage of Estonia, of which we were made aware of as soon as we arrived at Tallin airport, where we commented on the beautiful striped fabric on the airport seating. Estonia is celebrating 100 years since becoming an independent democratic republic, and we saw the distinctive black blue and white national flag everywhere, from buildings in the capital, to hay bales in the country. Our guide in Tallinn, Mrs Riin Alatalu, took us on a walking tour of the city explaining how it can be divided into two distinctive parts, the medieval area where fortified walls still stand, and original municipal and traders buildings can be seen in the central square, while the upper area of the city boasts ornate onion domed churches dating from the Russification of the country. Our guide was also able to give us an insight into the President of Estonia, whom she went to school with, another inspiring Estonian woman. Kersti Kaljulaid, was elected by Parliament on 3 October 2016, becoming the first woman and youngest person ever to hold the position. The President holds office for five years. They can be re-elected any number of times, but not more than twice consecutively. One of the advantages of seeing Tallinn through the eyes of an informed local was that not only did we see key landmarks that an independent traveller may overlook, we were also taken to locations that we would otherwise have easily missed, and Riin could explain the history of the country through the layers of changing architectural heritage. One of our stopping points was the open studios of an applied arts collective of female artists, working in ceramics, textiles, jewellery and leather. 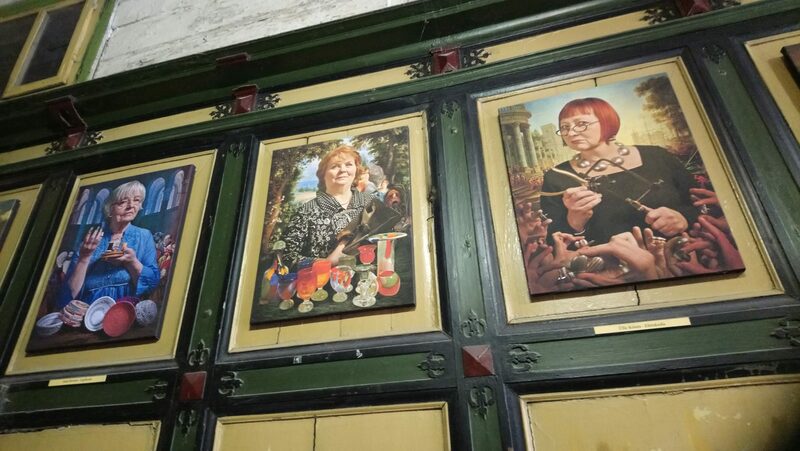 As well at their work, I was struck by the row of portraits of the female artists hung in the entrance way, which captured the images of the artists in an almost heroic way. There is a thriving artistic community in Tallinn, Riin also took us to a gallery with a wide range of artefacts which were more original than that found in shops that were more directly aimed at the tourist market. Saying this, the quality and range of merchandise in what could be described as tourist shops, was impressive, reasonably priced and the shop owners were friendly and in no way pushy, which was appreciated. We have plenty of tourist shops in Glasgow and Edinburgh too, and to a local, the tourist stores in Tallinn may seem as twee as the tartan shops on the Royal Mile in Edinburgh appear to a native Scot, however, my impression of the tourist merchandise in Tallinn was very favourable. We also have heritage walking tours in Scotland, often focused, particularly in Glasgow and Edinburgh, on our architectural heritage. I found it encouraging to learn that the Estonian approach to their architectural heritage is forward thinking, and there were newer buildings that had been built beside older buildings. In addition, evidence of older remnants of architecture that are uncovered in the course of renovation work, are preserved, adding to the character of a building as it is modernised and used for a different purpose. This approach avoids the trap of town they are listed and the planners being so concerned with preserving the old that new development is either stifled or old buildings are left to gradually disintegrate because cost of preserving them is too much for any developer to take on. This approach to preserving cultural heritage whilst embracing changed and adapting to the demands of modern life is evident everywhere. We spent a fascinating afternoon in the company of Mrs Mari Lepik in the village of Ansekala. Mrs Lepik is another inspiring Estonian woman, she is a University graduate, with five children who somehow finds the time to run a tea room, research traditional Estonian dress, contribute to the publication of a book on local dialects and traditions and pass on her knowledge to the next generation. Mrs Lepik showed us brilliant historical photographs of Estonians in traditional costume, wearing distinctive, hats, belts and pockets, along with the distinctive striped fabrics that we first noticed at the airport. Having thoroughly researched the costumes held in museum collections, she has recreated traditional designs and is teaching local children how to make them too. The book on local dialects has been a collaborative effort with the assistance of older members of the local community as well as her children who have contributed some of the illustrations. This book was not without its challenges, as due to periods of Soviet occupation, the older generation can still remember a time when the Estonian language was not to be spoken and there was some resistance and suspicion around this project that had to be overcome. Some of the stories we heard from Mrs Lepik were about the hardships experienced during Soviet occupation. These stories were brought into sharp focus on a visit to a farm on the Sorve peninsula, the owners welcomed us into their home where we were given the opportunity to try weaving wool into mats and to try making jewellery out of found metal. The found metal was gun shell cases which litter the forest area of the farm and have been there since Soviet occupation. When the owners first came to live on the farm, as well as the gun cases, they found a shallow grave with the bodies of unidentified soldiers. While the traces of former occupation are not difficult to find, the fact that discarded ammunition cases are being used to make jewellery is an example of the creativity and resourcefulness of the local people, in moving on from the past. They have installed solar panels on the farm to generate electricity and while diversifying into preserving aspects of local heritage for the benefit of tourists, there is a sense everywhere that Estonians are forward thinking, moving with the times, and keen to use technology to improve their lives. Our host on the farm with Maarika, our guide for the week, regaled us with some traditional Estonian songs. We spent four nights on a farm on the island of Saareaa, sleeping in wooden bunk houses, whilst enjoying a range of facilities including a traditional sauna. The restaurant area had a flat screen television, the toilets were modern, clean and tiled, and we had Wi-Fi access wherever we went. I enjoyed the tranquillity of waking in the morning to the sound of apples falling from the tree outside my door, whilst being fully connected to the outside world, should I wish to be aware of what was going on, or post updates via social media on what I was experiencing. We visited the Museum of Occupations and Freedom which is an excellent example of how Estonia is remembering and marking its difficult history whilst celebrating its freedom and embracing the future. The keywords of the museum’s permanent exhibition are occupation, resistance, restoration and freedom. The museum is managed by the Kistler-Rislso Estonian Foundation, named after yet another strong Estonian woman, Dr Olga Kistler-RIlso, the founder and president. The museum is dedicated to the 1940-1991 period in the history of Estonia when the country was occupied by the Soviet Union, then Nazi Germany, then again by the Soviet Union. The museum exhibits contain video story screens in which ordinary people tell their stories of how life was during Soviet occupation. Dr Kistler-Ritso died in 2013 at the age of 93. She lived through several occupations, Born in Ukraine in 1920, her mother died in 1922 and her father was arrested and sent to Siberia and no re-united with Olga and her brother until 1932 Olga returned to Tallinn and initially lived with foster parents, subsequently graduating from the University of Tartu’s medical school. She fled Estonia to Germany in 1944 working as an eye doctor and paediatrician in displaced persons camps. The personal testimony of Estonians, in the museum vividly explained the horror of occupation and the experience of ordinary individuals being uprooted from their homes and families. We also visited the television tower where there was an exhibition of life during the years of occupation. This exhibition charted life through the decades, and was a fascinating insight into what life was like in Estonia. Of particular interest were the displays of ordinary items and reproduction of the interior of an ordinary home, relating to life in the 1980’s and 1990’s when I was growing up in a completely different environment in Scotland. We met more enterprising women running a Juniper farm on Saaremaa. We learnt that Juniper syrup can be used in food as an alternative to honey or maple syrup. It can be used for flavouring juice, yoghurt, coffee, tea and fruit drinks. Juniper syrup can also be added to different pastries, bread and biscuits. It is used as a supplement for desserts including pancakes ice cream and custard. It can also be used in meat and fish dishes in sauce and dressings. Our hosts put on a syrup tasting session for us, which the local wasp population were keen to be involved in! The variety of tastes achieved through combining the juniper syrup with other things was amazing, we were constrained by our baggage allowance which prevented us from buying up their stock! Juniper twigs and juniper oil are also used as part of the traditional sauna experience in Estonia and we also used juniper wood to try carving traditional wooden butter knives. During out time on Saaremaa, we were introduced to the newly apointed Director of Kuressaare Castle Fortress on Saaremaa, Rita Valge, who was our guide, as we explored the castle. She explained the history and current use of this amazing building and sharing her ideas for its development. The caste is the only medieval fotress in the Baltics that has been fully preserved. The oldest part of the castle dates back to the 14th century. It is built on three levels, made of local limestone known as Saaremaa dolomite. The castle houses Saaremma museum, founded in 1865 and contains a range of exhibits influding the history of the town of Kuressaare, archeological artifacts and historical arrefacts of Saarema from the 13th century right up to 1940. The Director has a mammoth task in developing the castle as a major visitor atraction. It is already used as the venue for a major annual operatic festival and some of us were lucky enough to attend a concert performed by a visiting French mandolin quartert, however there is extensive work required, as the Director explained, to update some of the older exhibitions spaces which have not been changed in decades. Some of the exbhition cases are difficult to access for any cleaning and restoration work on the exhibits. The Director of Kuressaare Castle and museum on Saaremaa (left) with Maarika, our guide for the week. I have focused on the cultural and historical heritage of our visit for my report, we also spent time in the country, learning about natural resources, and wildlife, and included on our visit was a coastal walk looking at plant and bird life. Our guide Maarika organised an amazing range of experiences for us. We learnt so much about local traditions, from stone worshipping to how lime is used as a traditional building material. A key aspect of our visit for me was having the opportuntiy to try various activities from making jewellery from gun ammunitian cases to carving a butter knife from local juniper wood. The energy and dedication to their work of everyone we met was inspiring, with the ability to recycle and re-purpose materials and bring new ideas to traditional skills for current use was wonderful. I would like to thank Libby Urquhart from ARCH for giving me the opportunity to take part in this study visit, and I would also like to thank Maarika of Heritage Tours for her boundless energy, enthusiasim and organising skills in keeping us together and arranging so many activities and introductions to so many inspiring Estonian women. I have returned from this visit full of food for thought in terms of what I currently do and the many possibilities for what I could achieve in future. I hope to make a return visit to Estonia, the colour, warmth and beauty of the place and people was incredible.